DIDCOT, UK / ACCESSWIRE / December 12, 2018 / Altus Strategies Plc (AIM: ALS & TSX-V: ALTS), the Africa focused exploration project generator, announces the discovery of further zinc, cobalt and copper prospects at its 100% owned 71.8 km2 Takzim project ("Takzim" or the "Project") located in central Morocco. "Exploration at our Takzim project, including the recently granted Takzim Est licences, has returned encouraging copper, cobalt and zinc results. These include 7.78% Cu, 1.96% Cu and 1.36% Cu from outcrop and grab samples across a series of veins, which have been mapped discontinuously for over 1.2km in strike length. Rock chip sampling of narrow hematite-rich lenses within these veins has returned highly anomalous cobalt, with grades of 0.15% Co, 0.14% Co, 0.14% Co. 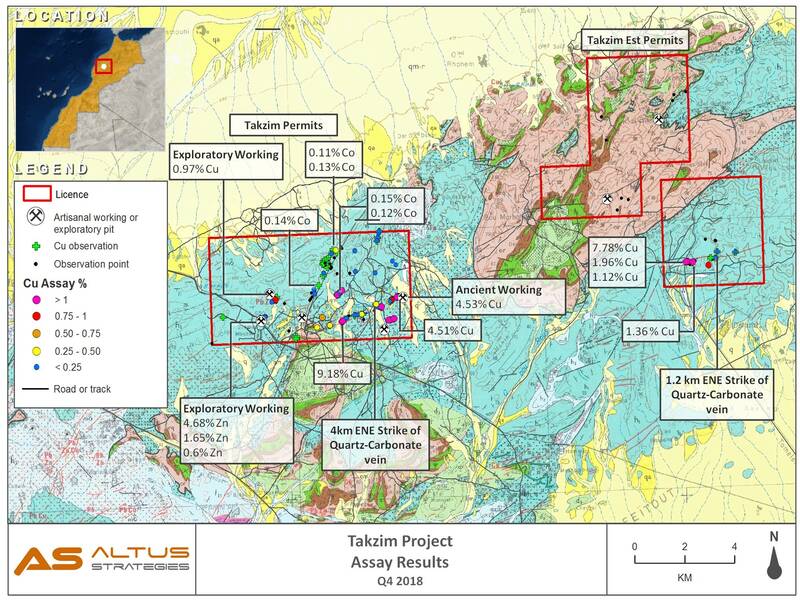 Elsewhere at Takzim, outcrop and grab sampling from quartz-carbonate veins has returned encouraging zinc grades, including 4.64% Zn, 2.22% Zn and 1.39% Zn. Notably a number of these veins lie within a 600m long northeast trending zinc and lead soil anomaly, as defined by an orientation soil sampling programme completed by the Company. Although at an early stage, we are encouraged by these further discoveries at Takzim. The next phase of exploration is currently being planned and will focus on establishing the potential source and scale of the copper, cobalt and zinc mineralisation discovered to date." 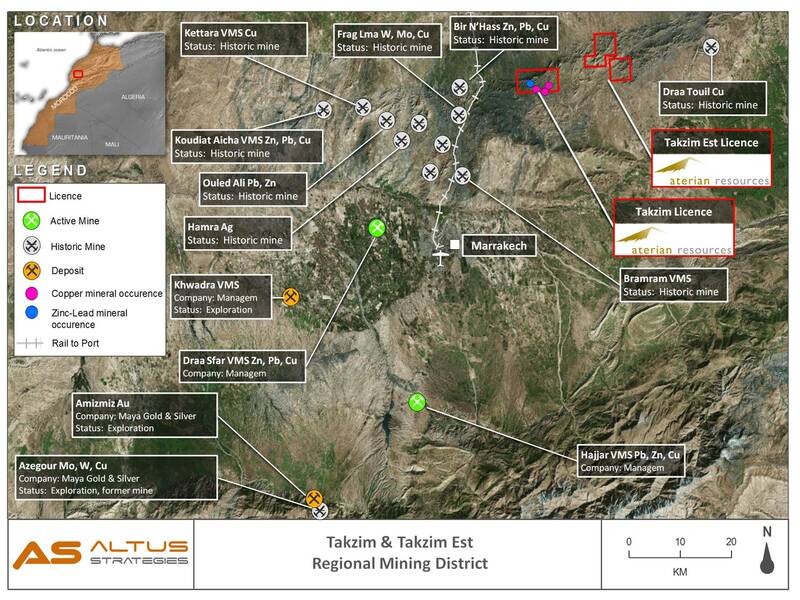 Mapping and reconnaissance exploration have been completed over the Takzim project, including the recently granted Takzim Est licences. In total 59 rock chip and grab samples were collected from a number of quartz-carbonate veins that crop out across the Project. Highly anomalous cobalt has been discovered to occur within narrow haematitic nodules and lenses hosted within the veins. The veins have been mapped as being up to 15m wide and invariably copper oxide mineralisation can be observed. Anomalous zinc grades (above 0.5% Zn) have also been returned from rock chip sampling of the veins. 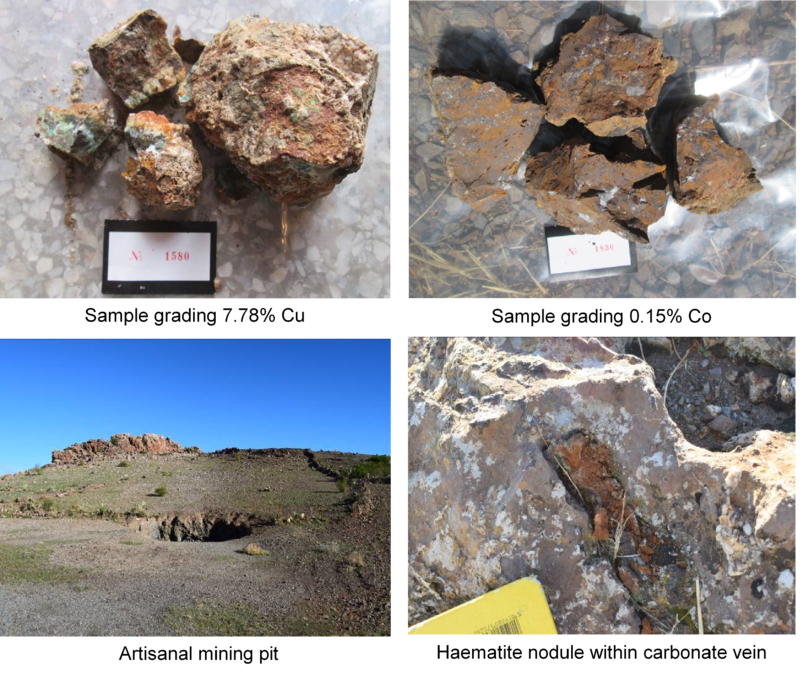 These include results of 4.64% Zn from grab sampling and 2.22% Zn from outcrop sampling in a small historic excavation. The Company has completed an orientation soil sampling programme at Takzim covering an area of approximately 1.6km by 1km. The results have identified a coherent 600m long by 150m wide northeast trending Zn-Pb anomaly. In total, 162 samples were collected on 100m spaced lines with samples collected at 50m intervals along each line. Soil samples were analysed using ALS Global's Ionic Leach method and interpreted by Globe-Ex Solutions who are pioneers of the Ionic Leach technique. The method aims to identify an anomalous signature which can be linked directly to the primary rocks below. The anomaly remains open along strike and an extended soil sampling programme is currently being planned. 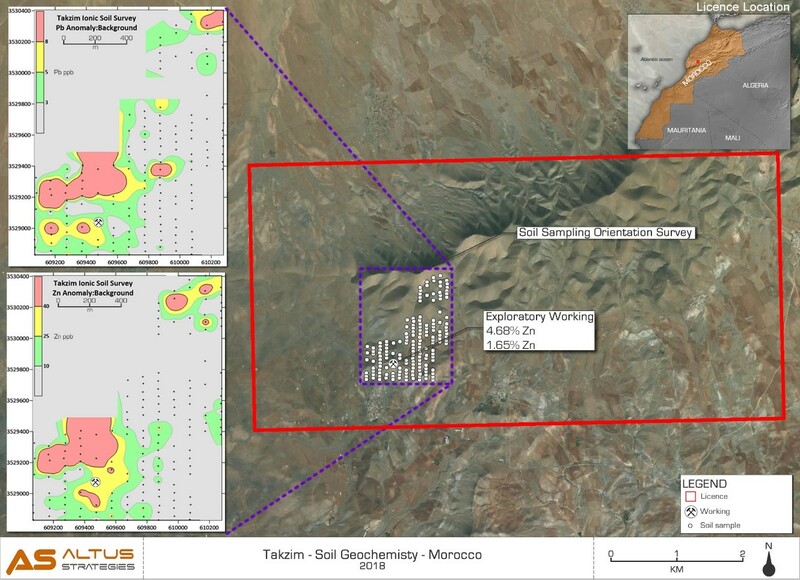 The 71.8 km2 Takzim project is comprised of five licence blocks situated in Eastern Jebilet province of central Morocco, approximately 200 km south of the capital Rabat, 35 km northeast of Marrakech, and approximately 6.5 km east of the historic Bir n Hass copper mine. The Project is accessible via asphalt roads and a network of smaller tracks and is within 7 km of an operating rail line. The geology of Takzim is dominated by Palaeozoic metamudstone and quartzites which are proximal to a Hercynian age granitic intrusion. Mineralisation to date has been observed in veins which have been mapped discontinuously for up to 4km in strike length and up to 15m in width. The veins are comprised variably of quartz and carbonate and are commonly massive to brecciated with a vuggy texture. Cobalt: 6 of 59 assayed above 1,000 ppm (0.1%) Co, ranging from less than 2 ppm to 1,515 ppm. A total of 162 soil samples were collected during the orientation soil sampling programme described in this release. These samples were analysed using the Ionic Leach Method. All sample preparation and assaying was undertaken by ALS Global at their laboratories in Seville (Spain) for sample preparation and Loughrea (Republic of Ireland) for analysis. Given the early stage nature of these programmes, no Quality Assurance and Quality Control ("QA-QC") samples were sent for assay. Rock samples were crushed with 70% passing -2mm. The less than 2mm fraction was pulverized with 85% of the sample passing <75 microns. The fine fraction of each sample underwent a four-acid digestion with ICP-AES analysis for a suite of 33 elements. All samples were analysed for their Au content by 50g Fire Assay method. The technical disclosure in this regulatory announcement has been read and approved by Steven Poulton, Chief Executive of Altus. A graduate of the University of Southampton in Geology (Hons), he also holds a Master's degree from the Camborne School of Mines (Exeter University) in Mining Geology. He is a Fellow of the Institute of Materials, Minerals and Mining and has over 19 years of experience in mineral exploration and is a Qualified Person under the AIM rules and National Instrument 43-101 under the rules of the TSX.